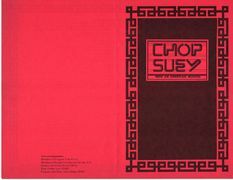 Chop Suey is a rock musical that follows the story of a Chinese American girl's struggle to find her voice. The musical was written by Nobuko Miyamoto and Benny Yee, and was commissioned by Mako, the director of the East West Players, in 1980. 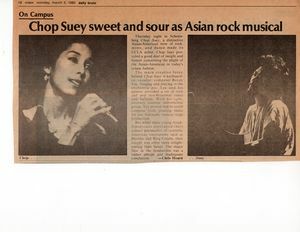 The musical was the first project of Nobuko Miyamoto's multi-ethnic performing arts organization Great Leap, reflecting its mission, at that time, to promote Asian American performing arts. 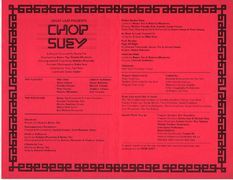 Another major contribution Miyamoto has made to Asian American theatre was Chop Suey (1980), a musical theatre piece she co-created with Benny Yee (who wrote the music). Mako had encouraged her to write a musical, and the show included a number of actors from the East West Players. The show toured at colleges and parks along the coast of California and the Pacific Northwest. In her book Asian American Culture on Stage: The History of the East West Players (2013, p. 106), Yuko Kurahashi describes the musical as "a tongue in cheek rock opera that dealt with familiar images of Asian American life in a new and satirical fashion." This page was last modified on 10 March 2018, at 09:26.